Inca Early Settlers - HISTORY'S HISTORIESYou are history. We are the future. Conflict & Cooperation: ​How has warfare shaped human history? Review: What ​three natural barriers helped protect the Inca empire from invasion? ​The Inca were not the first people to live in the Andes. The earliest people were hunter-gatherers who traveled according to the season and the available supply of food. Before long, those early peoples were not just living in the area, they were settling into villages. As early as 5000 BCE, those villagers were farming the western part of South America. ​The early settlers described below were challenged by the geography of the area, for sure. Look at the map of the area to the right. If you were an early settler, where would you want your tribe to put down roots? Like other ancient cultures, these early settlers worshiped many gods. As time went by, they learned how to work metals and they made beautiful pottery. Eventually, their towns grew into cities. Along with others, the Inca began as just one of many small, South American tribes. 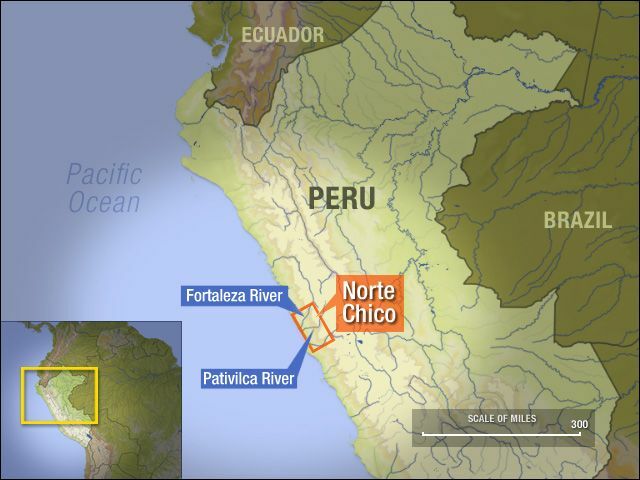 Norte Chico Civilization (3000 BCE - 1800 BCE): The first civilization to form in the Americas was the Norte Chico civilization of northern Peru. It was one of only six civilizations to form separately in the ancient world. 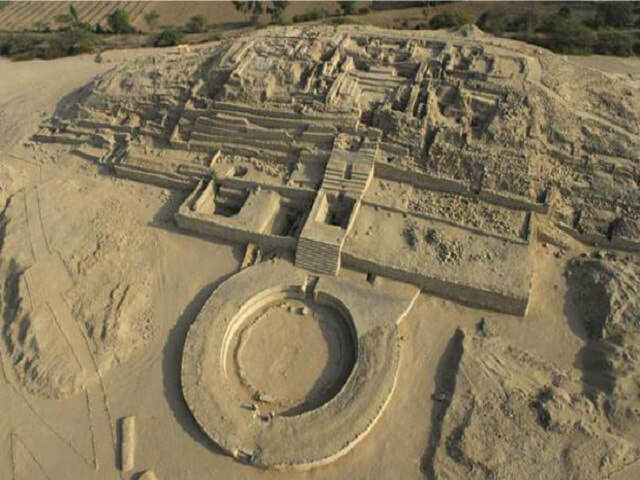 Archeologists think that around 30 major cities were part of the government formed by the Norte Chico, including the capital city of Caral located in the Supe Valley. Looking at their large, well-designed public structures, it's hard to believe that these people mastered the construction of such large scale monumental buildings yet did not have any pottery. The Norte Chinco were building their monuments at about the same time the Egyptians built their pyramids. Chavin (900 BCE - 200 BCE): The Chavin lived in the Mosna Valley in the west central part of Peru. They are named after their most well-known site the Chavin de Huantar, which was located high up in the Andes Mountains. The Chavin carved faces of their gods on massive walls of rock. They built a vast complex of temples and tombs at the north end of the Andes. 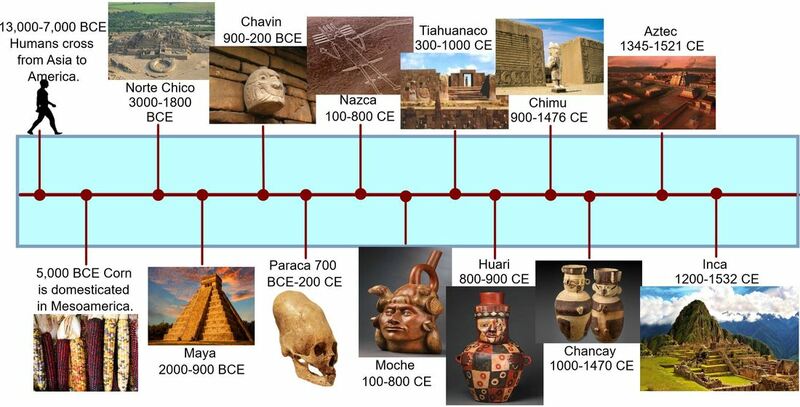 The Chavin culture reached its peak around 500 BCE. In the context of world history, Rome was still a small town at that time. Paraca (700 BCE - 200 CE): The Paraca developed along the coast of Peru. Archaeological evidence of this tribe includes complex, ancient weavings (below), gold, and pottery. Skulls have also been found that show some Paraca practiced cranial elongation. Other skulls show evidence of successful surgery (above). While the Paraca are known for their tombs and well-preserved mummies, they were also skilled farmers who used advanced irrigation techniques to water their crops. Nazca (100 CE - 800 CE): Long before the Inca, the ancient Nazca culture built an empire in Peru. The Nazca were located along the southern coast of Peru. Their culture was heavily influenced by the Paraca. The Nazca built underground aqueducts and were known for producing beautiful artwork and ceramics. Today the Nazca are most famous for their "Nazca lines". To please their gods, the Nazca made huge figures by carving long lines right into the ground of the dry plateau between the towns of Nazca and Palpa. You can still see these figures today when flying over the land in an airplane. Some of the figures are over 600 feet long! The figures include birds, monkeys, spiders, trees, fish, and llamas. The Nazca created these earthen artworks so that the gods of mountaintops and of the sun and moon could see them. I especially enjoy their fun, brightly painted pottery (shown below) as evidence that the Nazca people connected their lives to nature in a spiritual, joyful way. Moche (100 CE - 800 CE): At the same time the Nazca were flourishing in the south, the Moche developed along the northern coast of Peru. The center of the Moche civilization was Moche city. Moche city is known for two large structures, the Pyramid of the Sun and the Pyramid of the Moon (Huaca de la Sol & Huaca de a Luna). The Pyramid of the Sun was a huge structure made from over 130 million adobe bricks. Brown and cream Moche pottery was shaped in a most interesting fashion. Archaeologists found a pot that looked like a bird with human hands. Another pot looked like a potato with human eyes. Huaca de la Sol (left) and Huaca de la Luna (Right) are Moche temples for their gods of the sun and moon. The Tiahuanaco have many representations of Viracocha, the father god for the Inca at their temple complex. Tiahuanaco (300 CE - 1000 CE) At the center of Tiahuanaco culture was a large city built at 12,000 feet above sea level, high in the Andes Moutains. This city had a large temple complex with huge statues and a famous stone arch called the Gateway of the Sun. It boasted a population estimated at 50,000 people. Huari (800 CE - 900 CE) The Huari civilization developed to the north of the Tiahuanaco people and had much in common with them. The city of Huari was the center of their empire. The Huari had a central government to whom the Huari people paid taxes. 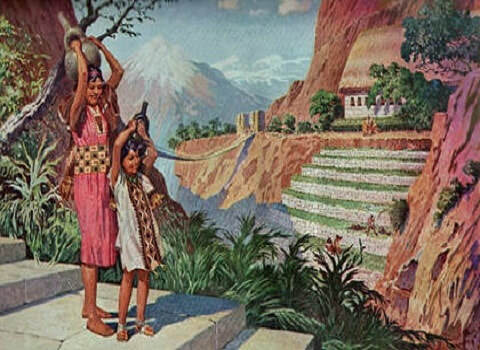 They also developed terraced farming in the mountains and had a well-built road system. The Huari reached their peak around 800 CE. About that time, however, something happened, and their civilization collapsed around 100 years later. Scientists are still puzzled by the Huari collapse. Though the Huari culture was relatively short-lived, their art - just like their culture - was truly advanced. Chimu adobe architecture is highly decorative. And absolutely beautiful. 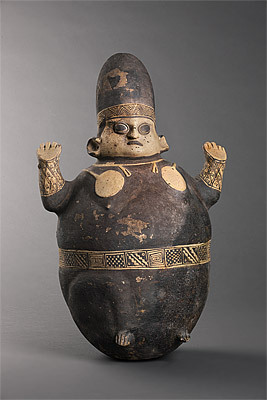 Chancay (1000 CE - 1470 CE): This tribe’s pottery shows a strange sense of humor that is both playful and frightening. Two examples are shown at right. Inca: Around 1200 CE, a tribe that would soon call themselves the Inca began to build the city of Cuzco. About 200 years later, the Chancay attacked the Inca. The Inca won that battle and in 1438 the new Inca ruler Pachacuti set about conquering all the other tribes on the western side of South America. Brainbox: What ​do the early settlers listed above have in common? The Inca began as a small band of people living peacefully in the Andes Mountains of South America. They made their capital at Cuzco (KOO-skoh). The leader of the Inca people was known simply as "the Inca" (which means “emperor”) or "Sapa Inca" (which means "lone ruler"). Like the Pharaohs of ancient Egypt, the Inca had absolute rule over his people. That is why his people were called the Inca (the Inca’s people.) The ruling Inca usually treated his people with care. Like most ancient rulers, he lived in luxury. While the people he ruled were hardworking peasants, the royal family had the finest of everything. Mostly, life was peaceful. In the beginning, the Inca had no plans to conquer every other tribe. However, in the mid-1400s a ruler named Pachacuti (pah-chah-KOO-tee) led the Inca to expand their territory. Under Pachacuti’s leadership, the Inca empire was born. ​The Inca expanded their borders until their empire was one of largest in history. Pachacuti gained territory through agreements with other tribes and through conquest. After Pachacuti, other Inca leaders continued to expand the territory of the Inca empire. On the map to the left you can see the original territory occupied by the Inca people. It's identified in red. The Inca did not need to expand the region in which they lived to protect themselves from other tribes living in the area. Natural barriers surrounded them. The Andes Mountains alone provided tremendous protection, but they also had the Amazon jungle and the coastal desert. They didn't need to expand to feed their population either. A larger population would only make more demands on farming communities, not less. Yet, in a mere 100 years, the Inca expanded their empire until it grew to be huge. Look at the map to the left one more time. In just 100 years, Inca control expanded from that small red dot to cover the entire west coast of South America. What drove the Inca? Why was expansion so critical to the Inca way of life? ​​Why ​did Pachacuti step in to lead the Inca people? The year is 1430 CE. For the first two hundred years of Inca existence, there were some disagreements with neighboring tribes. Life during that time, however, was mostly peaceful. One day, however, a neighboring tribe started a war with the Inca. This was very upsetting to the Inca ruler at the time. His army was losing badly. In those times in South America, warring tribes usually killed the people they conquered. The Inca ruler, of course, did not wish to die. He convinced himself that if he accepted defeat, the warring tribe might spare the royal family. The Inca ruler knew that even if they did spare the royal family, however, they would still kill most of the common people. The ruler’s son, Pachacuti, could not believe that his father was considering sacrificing his own people. In Quechan, the Inca language, Pachacuti means "he who overturns space and time" - in other words, "World-shaker." "World-shaker" called on the gods to help him, and then he got to work. The Inca people believed in a great many gods and goddesses. Like the ancient Greeks, the Inca believed that gods could be counted on to help or to hinder mere mortals in their wars and other earthly affairs. Legend says the gods decided to help Pachacuti save his people. After the battle, Pachacuti crowned himself Inca and replaced his cowardly father as the new leader of the Inca people. Pachacuti turned out to be a great leader. The Inca were saved from total destruction when Pachacuti rebuilt the army, went into battle, and won the day. That was a turning point in Inca history. With that decisive win, the Inca began their transition from a small tribe whose power and reach was limited to the Cuzco Valley to an empire. Seated on a shimmering litter, Pachacuti gave his army the order to attack. Playing panpipes carved from the bones of enemies and war drums made from the flayed skins of dead foes, his soldiers advanced toward the enemy, a moving wall of terror and intimidation. When the fog of battle lifted, the land had disappeared beneath the dead bodies of the Inca enemy. In the years that followed Pachacuti's first victory, he and his descendants defeated all the tribes in the basin of Lake Titicaca to the south. Military victory, however, was only the first step in Pachacuti's grand strategy of empire building. With each military victory, Inca officials set about establishing control of their newly won provinces. If provinces resisted, Inca rulers shuffled their populations, moving unruly inhabitants to the Inca heartland and replacing them with loyal subjects. Residents of remote walled villages were moved to new Inca-controlled towns nearer to Inca roads. Placing unruly residents near the Inca roads meant that Inca troops could easily rush to the site of any potential uprising. Inca governors ordered the construction of roadside storehouses for those troops and commanded local communities to fill them with supplies. Such planning leads many to think of the Inca as organizational geniuses. Conquest led to power - and wealth - and the organization of their empire led to peace. 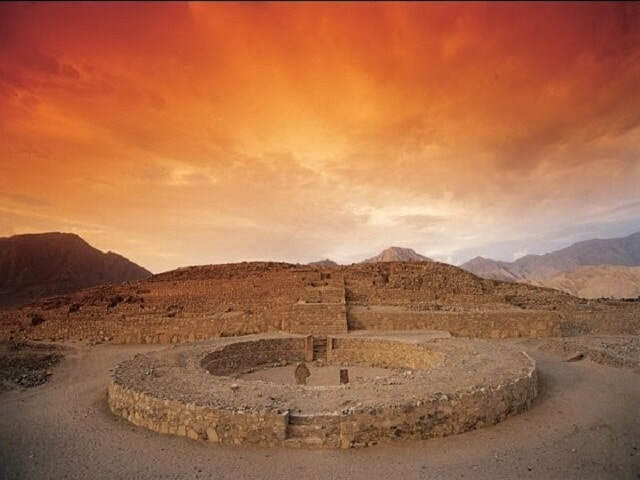 Under Inca organization, Andean civilization blossomed. Inca engineers transformed isolated roads into interconnected highways. Inca farmers mastered high-altitude, Andean agriculture. The Inca grew over 70 different native crops. Inca farmers were so successful that the empire was able to stockpile three to seven years’ worth of food. They kept those surpluses in storage complexes throughout the empire so that, in times of need, food could quickly be distributed to the Inca people. Though the Inca did not have a written language, government officials mastered the art of inventory control. They were able to track storehouse contents across the empire with an ancient Andean form of computer code - colored and knotted cords known as quipus (kee-poos). Inca roads brought the government's organization - and control - to all corners of the empire. Their successful cultivation of crops fed the empire. With such efficient control, Pachacuti did not always need to use warfare to expand his empire. Often, Pachacuti sent spies to regions he wanted to bring under his control. His spies would report back on the political organization, military might, and wealth of the area. Pachacuti would then send messages to the leaders of those lands explaining the benefits of joining his empire. Along with the messages, he sent them presents of luxury goods such as the finest Inca textiles and promised that they would be far richer as subjects of the Inca than if they stood alone in opposition to the Inca. Rather than go to war with the fierce Inca army, most leaders accepted the rule of the Inca and gave in peacefully. Land of the Four Quarters. The land the Inca ruled their capital city, Cuzco became known as the “Land of the Four Quarters.” It was named that because the Inca empire was divided into four parts for ruling purposes. Brainbox: Why ​do you think Pachacuti spared the lives of the peoples he conquered?